I do not think it is a good idea to combine TCA and microneedling on the same scars, at least not in less than four months from each other. The TCA method is used for ice pick scars and it is supposed to disrupt the scar tissue and trigger collagen. Microneedling is doing the same (and can be used on any type of acne scars). Scars are a difficult problem and what works for one person, doesn't necessarily work the other so you use a dermastamp on one side of your face and the TCA cross on the other to see what works better for you. If they both work, you can combine them but as I said, keep a very long time between those two. Initially, perform the TCA cross on one scar only to see how the scar reacts (will it not get worse?) but be patient. It can take a long time for the results to show and the same is valid for microneedling. I suggest a 1.5 mm dermastamp (with 35 needles). Stamp the scars every 3-4 weeks. You can use the dermastamp on your mouth lines as well. Dermarolling / Microneedling / Re: Can I roll over fillers in the nasal folds? Dermarolling / Microneedling / Re: When to replace Dermastamp? See our instructions for more on the topic of how long a roller/stamp lasts. If you have just a few stretch marks, you can do both dermarolling and dermastamping during the same session. Wait four weeks and do it again. If you have too many stretchmarks to do both rolling and stamping in one session, then roll them thoroughly and then some days later, stamp them thoroughly. You do not have to stamp them all in one session if you have very many. Stamp a few and a day or days later stamp a few etc. but do it thoroughly and densely. You should definitely not do any invasive skin procedures, including dermarolling for at least six months after the last Accutane dose. If your scars did not respond to all the treatments you have had, such as twelve Fraxel sessions, it is not very probable that dermarolling will work too well on you. With a 1 mm size dermaroller, you should roll every 10 -14 days. It would have been better to purchase a 1.5 mm dermastamp instead of the 1 mm size because you seem to have very stubborn scars and in the future, if you get some results from the 1 mm size stamp, you could even consider a 2 mm dermastamp. It is a good idea to try the suction pump, as none of the treatments you had were targeting scar tethering. The skin does get dry and rough right after dermarolling because the skin is being deeply renewed and it takes some time for the protective film that prevents water evaporation from the skin to be reformed after dermarolling. Dermarolling / Microneedling / Re: Dry skin, uneven in texture and color - what to use? Unfortunately, from our experience, dermarolling doesn't help with broken capillaries and you should try vascular laser treatment for that. Dermarolling will not help with the dryness either. Apply almond oil on your skin (while the skin is still wet) after a bath or shower. I keep a bottle of almond oil in the fridge and refill a small container that I keep in the bathroom. For the dry parts of the face or body (such as around the eyes or on the back of the hands), I also recommend the Infadolan ointment that we sell. Apply really just a little because it is very greasy. It is a semi-occlusive ointment that prevents evaporation from the skin and thus keeps it extra moisturized. Using water-based creams or glycerin on the skin does not moisturize it for more than a few minutes. Topically added water actually increases the evaporation of water from the skin. The skin contains enough water. The top layer of the skin works as a barrier that prevents evaporation from the skin. If this barrier doesn't work properly or is temporarily compromised, the skin becomes dry. Adding water does not solve this. Establishing a barrier that prevents water evaporation solves it. That is why oils are much better moisturizers than any light moisturizing cream because oils form a film on the skin that prevents the evaporation of water. Retin A is perhaps not suitable in your case. It does not help with broken capillaries. It evens out skin pigmentations caused by overproduction or uneven distribution of skin pigment melanin and it speeds up diminishing of acne or post acne spots. It also improves sun damaged skin but not the damage to the capillaries. For the skin texture, try a 0.5 mm regular roller but you must moisturize a lot, preferably with some oil. Due to your sensitive, dry skin, roll only once or twice a week. 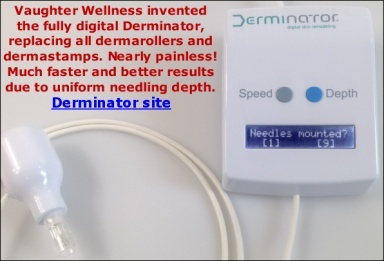 Last but not least: As I have mentioned many times before, dermarolling is very effective for scars but not very effective for enlarged pores. Pores are not scars, they are ducts in the skin and their size is genetical. Very few of our customers improved enlarged pores with dermarolling. It's a pity that I removed the posting about why all the needles currently available (with photos and detailed explanations) are not appropriate. But hypodermic needles are the worst of all - you'd end up with scarring if you'd single-needle with them - don't even think if it.. I am really sorry that our needles are taking so long to produce. But they should be available this year, at the end of the year. A powerful laser still is an expensive device and you have to pay for the time of the surgeon and all the other stuff, whereas microneedling tools are much cheaper and you perform it yourself. I suggest a 1.5 mm dermastamp (stamp the scar densely every three weeks). Add the suctioning (from the second day). Yes, give the skin a rest for a couple of days before you stamp again. Stamp the icepick scars with the 1.5 mm as well. The suction pump will not help ice pick scars or enlarged pores in my opinion because they are not tethered. Hi Amyk, could you please email me a photo because you had deleted the photos from the other thread and I do not remember exactly how it looked. Or make a photo how it looks now, it would be even better. Tretinoin evens out the skin tone. Buy a regular 0.5 mm dermaroller and roll about twice a week. A 1 mm or a 1,5 mm dermastamp is a great choice for the so called 11's and these wrinkles very often improve. If you have wrinkles above the upper lip, use the stamp there too. This area is very sensitive and you may need a numbing cream here (I do). These wrinkles also often respond well to intensive microneedling. Dermarolling / Microneedling / Re: Could you tell me what type of scar this is? Well, I'm sad you removed the photo - it was a great example of pitted scars and would serve nicely to document your progress. You should buy a 2 mm dermastamp (we have it in stock). It is a very effective tool for deep pitted scars.